Post-Tropical Cyclone Hermine has essentially spun further away from the north east coast, and while there is not much visual evidence of rough surf in some areas, it is anything but smooth sailing for those out on the ocean. 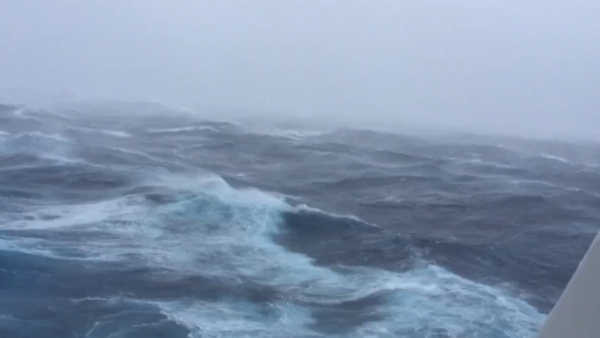 A passenger on Royal Caribbean's 'Anthem of the Seas' cruise ship heading from New Jersey to Bermuda posted a video online, and said they recorded gusts of about 90 knots. "All was good until about early morning, that was when the ship started swaying a bit here," said Derek Biedermann, "we saw some swells about 40-50 feet at one point." Biedermann, who is from Brick, New Jersey says that dishes were going 'all over the place' in the restaurant on the boat. "Exciting for me, but half the ship is in their room right now over the toilet," Biedermann adds. The 'Anthem of the Seas' ship set sail from Port Cape Liberty on Saturday night.